more run-off, the greater the impact on surface waters. The storm water utility fee will be billed on your monthly utility bill and is identified as a specific line item. The monthly fee will not apply to undeveloped land, agricultural land without a residence, parks, gravel pits, railroads or City owned property. Credits will be provided to commercial property for privately owned and maintained detention ponds. station operations, used oil, and pesticide disposal. To report suspected illicit discharges, contact the City Engineering Department at 507-437-9950. 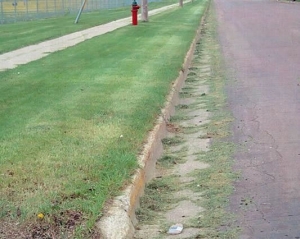 The City of Austin requests that property owners consider the impacts of grass clippings on the street and other paved areas. Grass clippings have the following impacts on our streams and lakes if they are allowed to enter the City storm sewer system. The city of Austin conducts a annual storm water pollution prevention plan meeting that is held and publisized for each spring.